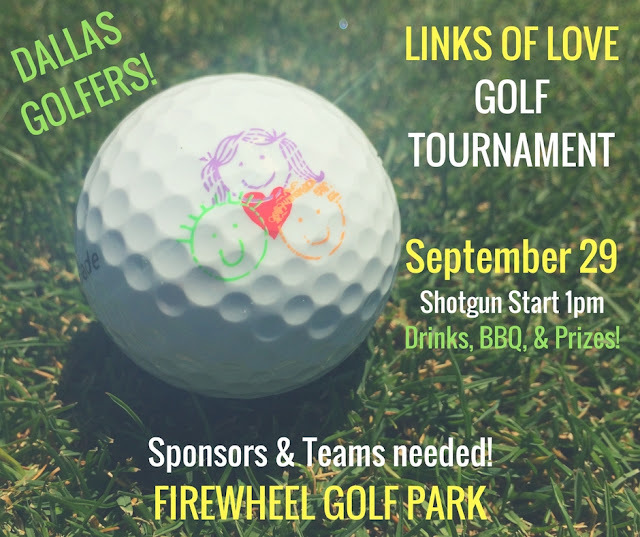 We are thankful for the 10th Annual Links of Love tournament that will take place on Friday, September 29, 2017, to benefit Children’s Craniofacial Association (CCA). Your funds raised through this fun event will help children born with craniofacial disorders receive the medical care they need from qualified surgeons to complete life-altering surgeries so they can talk, eat, hear, and see. Firewheel Golf Park in Garland, TX will host golfers again this year. Registration begins at 11:30AM. We encourage participants to arrive early to check out the exciting auction items available for bidding, grab a box lunch, and to take a few practice swings before heading out on the course. A shotgun start begins at 1:00PM. Enjoy complimentary drinks while you play. After your round of golf, share a barbeque dinner with your golf friends, earn prizes, and find out who won the silent auction items. Golfers will be able to participate in a 4-man scramble for $125 per player, or sponsor a team for $500. Participants receive free lunch, dinner, and beverages on the course. CCA has different sponsorship packages available for those looking to gain some marketing in return. Sponsor names will be reflected on pin flags, hole signs, cart signs, banners, social media and in our printed newsletter with over 15,000 subscribers. Those unable to attend are encouraged to spread the word to their golf loving friends and you can even register to “sleep in” and still receive donor acknowledgement, a golf glove, a goody bag, and more!